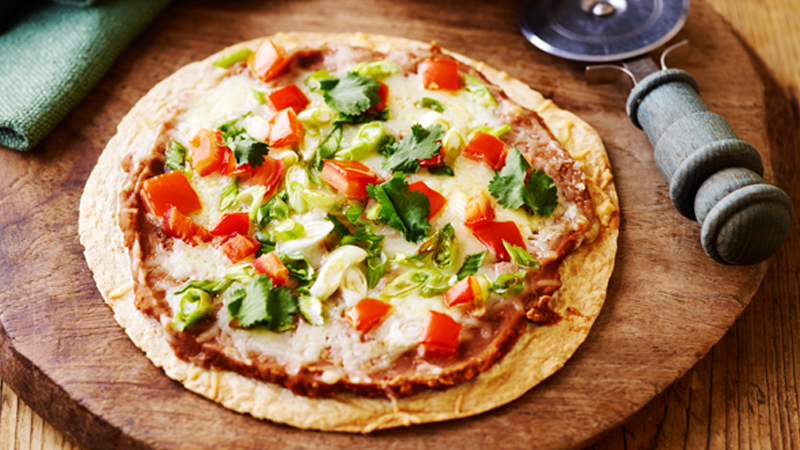 Italy goes Tex-Mex with this delicious cross between a pizza and a tostada! 1. Preheat the oven to 200ºC (180ºC for fan assisted ovens), gas mark 6. Line 2 baking sheets with baking paper. 2. Spray one side of each tortilla with olive oil cooking spray. Place 2 tortillas, sprayed-side down, on each baking sheet. 3. Spread 1/4 of the refried beans on each tortilla. Scatter over the cheese and top with the spring onions and tomatoes. 4. Bake for 8-10 minutes or until the tortillas are crisp around the edges and the cheese is melted and bubbling. Garnish with coriander leaves and sprinkle with freshly ground black pepper. Serve with soured cream on the side. • Vary the toppings however you like, try adding sweetcorn, chopped olives or sliced jalapeños instead of the tomato. 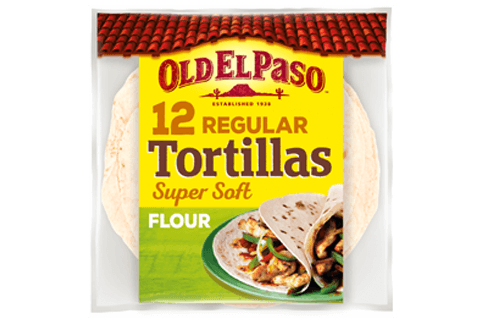 • If you don’t have cooking spray just lightly brush one side of each tortilla with a little olive oil.